Figure 3. Intensive training presentation in neighborhood of Imbaba. Figure 4. Community meeting to discuss water study results. Figure 5. Awareness flyers to reduce water consumption. Figure 6. Activities for children and youth, organized by the group, to promote efficient use of resources. The Platform of Ecocitizen World Map Project (EWMP) provides the incentive and understanding for communities to crowd-source urban data and holistically assess the condition of their neighborhoods. This promotes more democratic and grassroots leadership in proposing and planning interventions that directly enhance the sustainability and equitability of cities. Geographic information systems (GIS) and urban metabolism information systems (UMIS) are the two primary methods employed for organizing and displaying data through the Platform. UMIS describes a system, along with all of its components, to account for and analyze resource flows as they move from the natural environment (i.e. a source) through the built environment (i.e. a city) back to the natural environment (i.e. a sink). Sankey diagrams are a means to represent this whereby the width of arrows in a linear flow is proportional to their quantity (Google Developers 2015). The Platform displays data in visually accessible ways that communities can customize and interact with directly; specifically, spatially dynamic online maps with multiple dataset layers and Sankey diagrams. 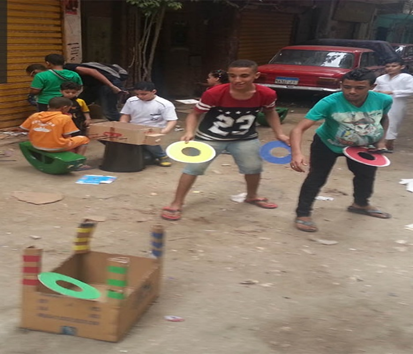 The Project’s piloting in Cairo, established in early 2014, has been led in part by El Balad, a local community based organization (CBO) in the neighborhood of Imbaba. As one of the most densely populated informal areas in Egypt, Imbaba is considered among the oldest districts to host rural immigrants. Originally, Imbaba was agricultural land, subdivided illegally and built by the locals. The area has since been consolidated and is a preferred destination for low to middle income households given its proximity to other Cairene districts and low rental costs. Traffic congestion by the nearly 5 million cars on its roads, coupled with unregistered smelters and other industries, has resulted in Cairo having one of the highest pollution rates of any city second only to Delhi. This will further exacerbate the effects of global climate change, the results of which are projected to include sea level rise into Egypt’s fertile Delta region and freshwater resources growing increasingly scarce from desertification. Informal areas, which house approximately 60 percent of the city’s population, are anticipated to be highly vulnerable to increasing heat waves. Such areas also tend to be the most densely populated in a city that averages 89,000 people per square kilometer (Khalil 2010). The degree of urban consolidation can pose challenges for mitigation upgrades and adaptation measures in response to climate change. Already, data for Imbaba published through the Platform has brought attention to water quality, access and management issues. In terms of the former, quality testing has revealed an increase in the percentage of coliform bacteria as a result of broken piping infrastructure that mixes potable water and sanitary streams, as well as an increase in copper traces due to old piping infrastructure and minimal storage maintenance. In terms of management, parcel audits have shown poor water flow from the main supply lines and the disproportionate use of water demand according to building archetypes. This presents citizens with visual guides to suggest areas for conservation (e.g. minimizing use in cooking), efficiency (e.g. low flow shower heads), cascading (e.g. grey water use for rooftop gardens), and advocating for municipal upgrades of infrastructure upstream (e.g. retrofitting crumbling concrete plumbing with more enduring materials to minimize water loss). 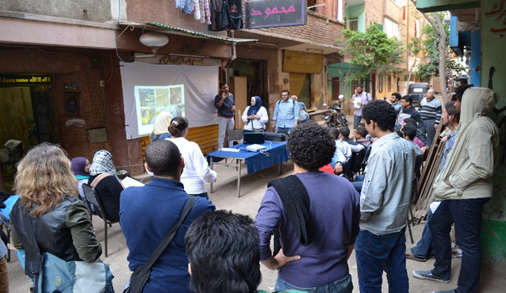 A series of printed materials and awareness events, organized by El Balad and the students, disseminated the pilot study results and ensured transparent flow of data to the local community. 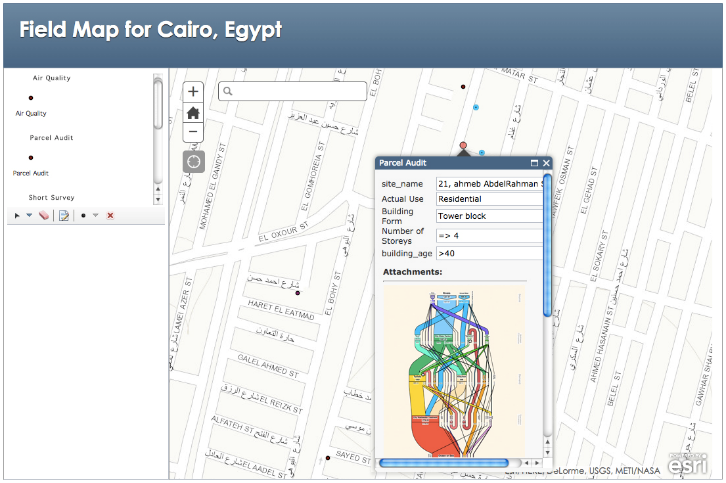 The Project involves El Balad mobilizing citizens through its existing networks and students at Cairo University being trained on adapting and applying public participation techniques, GIS and UMIS, by academic faculty and the EWMP Partnership. This presents citizens with visual guides to suggest areas for conservation (e.g. minimizing use in cooking), efficiency (e.g. low flow shower heads), cascading (e.g. grey water use for rooftop gardens), and advocating for municipal upgrades of infrastructure upstream (e.g. retrofitting crumbling concrete plumbing with more enduring materials to minimize water loss). A series of printed materials and awareness events, organized by El Balad and the students, disseminated the pilot study results and ensured transparent flow of data to the local community. The students participate in labs, lectures, and group activities that touch on these topics. A community roundtable invites elders, youth and leadership from the selected study area to a presentation on the EWMP. The event includes a discussion that refines the purpose, scope, preferred decision-making models (e.g. consensus-based), study area boundaries, data-reporting standards, and ownership of research outcomes. At the Imbaba roundtable, the community prioritized concerns around access and quality of freshwater supply. The roundtable is also an opportunity to propose realistic targets, relevant indicators, and forms of participation for the data collection, input and analytical processes. Examples of specific activities can include training on GPS devices, co-facilitation methods, computer data entry, digitizing, and geocoding techniques. An intensive training is held as a two-day training-of-trainers event where the CBO and students facilitate workshops and initiate the citizen-led collection of data. Teams are arranged according to different collection methods; namely environmental assessments (e.g. air and water quality tests), quality of life questionnaires, and parcel audits of resource management such as water demand. At the designated workstations set up within the study area, data are digitized, samples are tested against established baselines, and results are analyzed. The EWMP helps ensure equitable and grassroots interventions to reduce Imbaba’s vulnerability to climate change. Technical capacity gained through the process has enabled the group to approach other informal areas including Gezirat Al-Dahab and Warak, Giza. The Pedagogy of EWMP is defined through a research justice framework, breaking down existing structural barriers between researcher and researched, and includes a training-of-trainers methodology to support capacity-building among students and citizens. These trainers then engage in knowledge-transfer activities with citizens, facilitating bottom-up data collection, analysis and publication for the Platform. This case study is taken from a publication in the ARC3-2 Journal, republished here with permission from the authors. The Ecocitizen World Map Project (EWMP) is comprised of three distinct yet interwoven components: the Partnership, the Platform and the Pedagogy. The Partnership is led by US NGO Ecocity Builders and joined by Esri, the Association of American Geographers, Eye on Earth (a partnership of UNEP, Abu Dhabi Global Environmental Data Initiative), Cairo University, Mundiapolis University, University of California at Berkeley, local NGOs and community partners. Brookings Institute. Global MetroMonitor . November 30, 2012. http://brook.gs/1IqM6Ns (accessed December 8, 2014). Cairo Governorate. Cairo Portal. 2014. www.cairo.gov.eg (accessed January 15, 2015). Central Agency for Public Mobilization and Statistics. Population Estimates 2015. 2015. www.capmas.gov.eg (accessed February 9, 2015). Developers, Google. Sankey Diagrams. 2014. http://bit.ly/1BU1qSm (accessed January 8, 2015). EcoCitizen World Map Project. Field reports and online platform. 2014. http://ecocitizenworldmap.org/ (accessed November 12, 2014). Egyptian Environmental Affairs Agency. 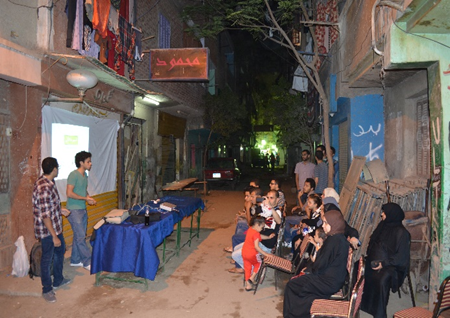 "Climate Change and Community Based Adaptation in Informal Areas in Greater Cairo." Report, Ministry of Environment, Cairo, 2014. Giza Governorate. Giza Governorate Website. 2015. www.giza.gov.eg (accessed January 15, 2015). Global Construction Review. Arabtec signs $40bn Egyptian housing contract. March 19, 2014. http://bit.ly/1CmU0FF (accessed December 12, 2014). Khalil, H. "New Urbanism, Smart Growth And Informal Areas: A Quest For Sustainability." In Sustainable Architecture & Urban Development, by Husam AlWaer, Jamal Al-Qawasmi Steffen Lehmann, 137–156. Amman: CSAAR, 2010. Qaliobia Governorate. Qaliobia Governorate Website. 2015. www.qaliobia.gov.eg (accessed January 15, 2015). World Bank. Country at a Glance: Egypt. 2014. http://bit.ly/1CZXdNj (accessed November 28, 2014).